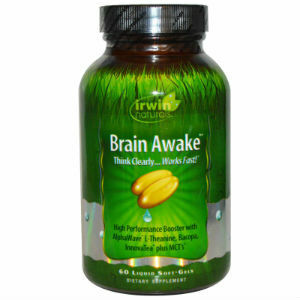 The product that we are reviewing today is called Brain Awake, made by a company called Irwin Naturals. Brain Awake is a product that claims to be able to boost mental functions. It claims to be able to improve memory, energy, and better mental focus. So, without further ado, let us read on to learn more about this product. Folate- A member of the B-vitamin family, believed to be linked to depression reduction. Vitamin B12- Linked to fighting depression and lowered cognitive performance. Vitamin B6- Linked to lowered cognitive performance if there is a deficiency of Vitamin B6. One bottle of Brain Awake contains 60 liquid gels. The recommended dosage is 3 liquid gels per day. They are to be taken at meal times. Along with food, they are to be taken with a glass of water. A product like Brain Awake targets workers and students. As Brain Awake contains caffeine, there is the possibility that the user will have difficulty sleeping if taken at night. Thus, it is recommended that those who have difficulty sleeping after having caffeine at night refrain from taking a late dose of Brain Awake. Additionally, there is a warning to residents of California per Proposition 65. This warning states that Brain Awake contains ingredients known to the state as being harmful to reproductive organs and fetuses. Thus, it is recommended that women who are pregnant or nursing refrain from taking Brain Awake until consulting with a doctor. A bottle of Brain Awake containing 60 liquid gels (a 20-day supply) will cost $27.99. A purchase at or in excess of $50 will get you a 10% discount. The discount goes to 15% if the total purchase is $100 or greater. A purchase also gets the customer coupons that have a total value of $60. Each customer also gets information regarding health and a CD, which is all part of a Wellness Kit. There is no mention of a guarantee for potentially dissatisfied customers when it comes to Brain Awake. This is not necessarily saying that one does not exist, but it is not mentioned on the site. Another point of concern is that there are no customer reviews to get an idea of the effectiveness of the product. Brain Awake by Irwin Naturals is a good product that says it can improve mental performance in several key areas. The ingredients are all natural so there is no worry about chemical side effects. The downside to Brain Awake is the fact that there is a lot of caffeine in it so there is a possibility of sleep being affected by taking this supplement in the evening. Another downside to this product is the fact that there is no clearly stated guarantee for customers and there are no easily found reviews of the product to assist potential customers in making a decision about whether to purchase Brain Awake. Henry Costa	reviewed Irwin Naturals Brain Awake	on November 20th	 and gave it a rating of 3.